A striking new willow structure made by a group of Mayo artists is wowing visitors at the National Museum of Ireland – Country Life, Turlough Park, Castlebar, following its official unveiling last week. Teach Saileach/Willow House is a large bee-hive shaped ‘outdoor room’, woven from living willow and other natural materials using traditional skills. It forms an impressive new woodland structure for museum visitors to explore and will also be used as an outdoor classroom for education programmes. 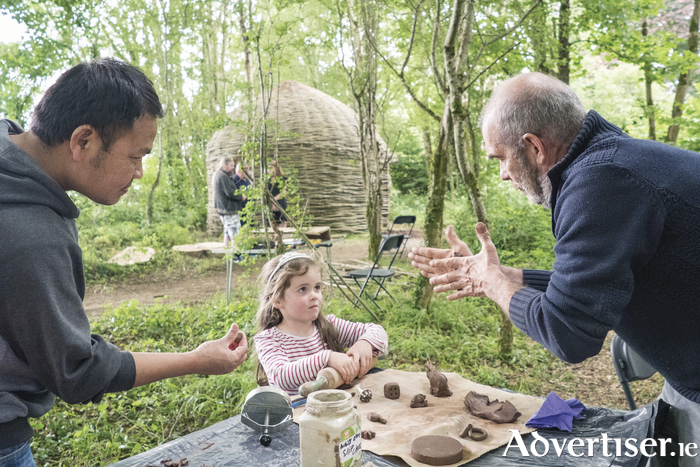 Members of Mayo Arts Squad, a community arts initiative sponsored by Mayo County Council, partnered with the National Museum of Ireland – Country Life to create Teach-Saileach/Willow House as part of the On Sight annual arts trail in the award-winning grounds of Turlough Park House. The artists and designers involved were: Mick Smyth (coordinator ); Brendan Timlin, Kevin MacNeely, David McInerney and Saw Tun. The artists worked on site for six weeks to complete the building project while Sanita Vecbrale, Paul O’Driscoll and Aidan Crotty also created three large willow sculptures dotted across the museum grounds as part of the arts trail. Ms Jo Holmwood from the children’s arts organisation, Kids Own Publishing, was in Turlough Park last week to perform the official launch of Willow House. Willow House is located in a secluded but accessible scenic wooded area to the rear of the exhibition galleries, close to one of Turlough Park’s oldest trees. Visitors are welcome to explore Willow House at any time during museum opening hours. Page generated in 0.1175 seconds.